A buddy of mine is getting about 1 Mbps through his Cisco 2621XM based VPN. Additionally, the CPU was maxed out during the transfer. (In my testing, I was able to max out a 7 Mbps cable modem using the Cisco VPN Client connected to the same endpoint, so the problem isn't on the server side.) This really raised my interest regarding the anticipated throughput of various Cisco routers when used as a VPN client. Fortunately, the Chesapeake NetCraftsmen did this research a while back. The found that a 2600 router equiped with an AIM-VPN/BP could handle 2 to 2.8 Mbps with 60-65% CPU utilization. The AIM-VPN/BP is an advanced interface module that provides hardware encryption for several router models including the Cisco 1700, 2600, 3600, and 3700 series. 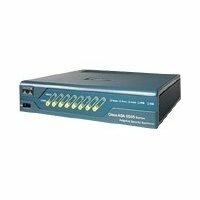 If you just need an Ethernet only VPN router, it probably makes sense to invest in a Cisco ASA 5505. The 10-user model is around $400 at Amazon and is rated for 100 Mbps of 3DES VPN throughput.